For someone who was born in Borneo, I was quite surprised and excited to check out this luxury brand called "Borneo Soap". All the ingredients used are all from Sarawak - Bario Rice, Barley, Sago, Oats, Pepper, Kaffir Lime, Betel Leaf, Honey, Luffa and Dabai. The story of Borneo Soap starts deep in the world's oldest rainforest. Inspired by conventional wisdom, Borneo Soap fuse time honored tradition with modern bath and beauty elements. Individually crafted, our skin care products are made from natural ingredients native to the rainforest of Borneo. Ingredients heralded for their healing, therapeutic properties and long used by the indigenous people of Borneo in their bath and beauty rituals. Derived from specific skin-loving ingredients, every attention to detail and quality is given to each and every blend. All products are enriched with Goat's Milk and vitamins to provide a luxurious cleansing experience, making them rare gems to be treasured and enjoyed daily. Borneo Soap is handcrafted with quality, all natural skin-loving ingredients. It provides a luxurious and extremely gentle bath experience, that islanders have enjoyed for ages. Just so you know that it takes 21 days to produce each batch of soap bar. To retain the natural goodness of the ingredients, Borneo Soap employs the time honored cold press method. 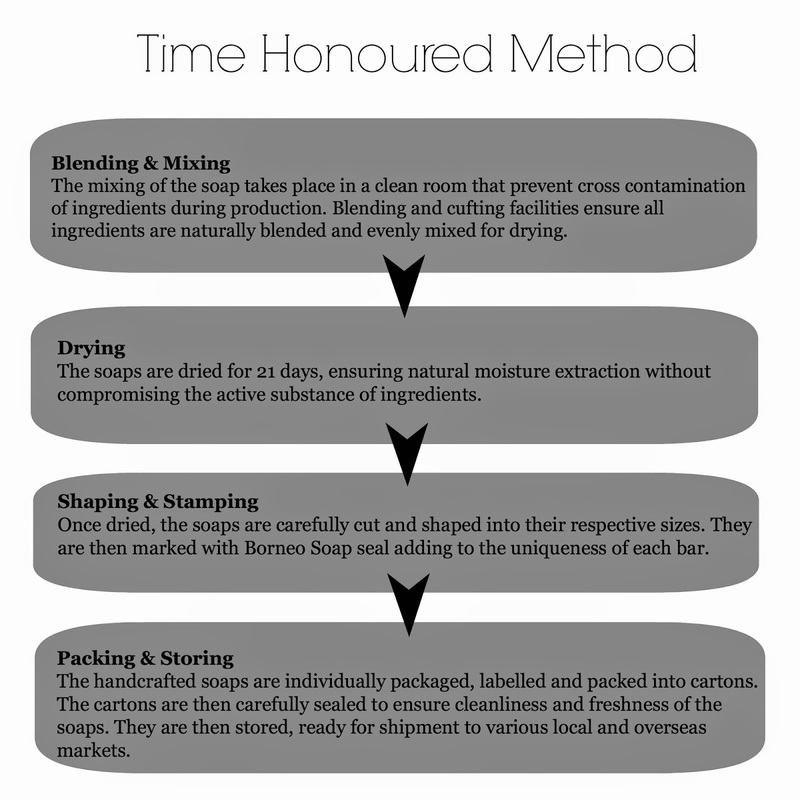 In case you're wondering how the soap was made through the time honored method, there you go. The Borneo Soap's manufacturing facility is set up and operated in strict compliance with the ASEAN Guidelines for Cosmetic Good Manufacturing Practice and The Control of Drugs and Cosmetics Regulation 1984 of Malaysia. Huge thanks to Borneo Soap for the pamper treats at the Spa Village, The Ritz-Carlton! Not only to allow us to enjoy the amazingly great (1/2 hours full body papaya scrub and 1 hour full body massage) spa session, but also shower with the Borneo Soap provided in each room. I was truly amazed how smooth and moisturized my skin turned out after used the soap bar. 10% OFF total purchase. Use coupon code "borneosoap-Caroline" during checkout. *Valid from 1st May to 31st May 2014. Buy 2 Free 1 Promotion. Buy any 2 Borneo Soap products, get a Beras Bario Body Bath Soap for FREE. No coupon code needed, system will automatically allocate/add the free item to the cart. *Valid from 1st May to 31st May 2014.